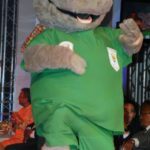 Team South Africa’s mascot for the 2012 London Olympic Games is Chukuru, a rhino, who was introduced to the nation at a function in Johannesburg. He's a fluffy young leopard with green dreadlocks and a wide smile; he's energetic, enthusiastic, sociable, self-confident and ambitious - and he loves football. 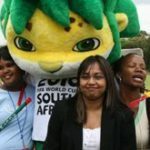 Meet Zakumi, the official mascot for the 2010 Fifa World Cup.